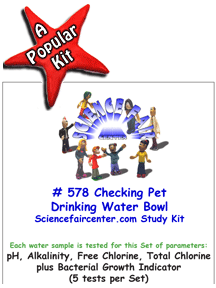 Checking Pet Drinking Water Bowl Tests When to Clean and Change Water. Checking Pet Drinking Water Bowl Tests. Monitor pet water source to determine when to clean and change water. Checking Pet Drinking Water Bowl Tests. Experiment combines chemical and bacteria testing and most any kind of pet or pets. Chemical testing only takes a few minutes per sample. 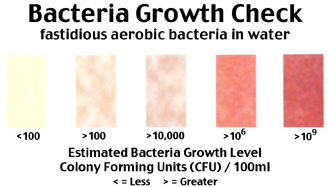 The bacteria sample grows for 2 days before reading. 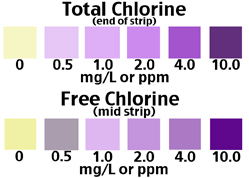 Each water sample is tested for this Set of parameters: pH, Alkalinity, Free Chlorine, Total Chlorine plus Bacterial Growth Indicator (5 tests per set). Monitor pet water source to determine when to clean and change water. Experiment combines chemical and bacteria testing and most any kind of pet or pets. Chemical testing only takes a few minutes per sample. The bacteria sample grows for 2 days before reading.